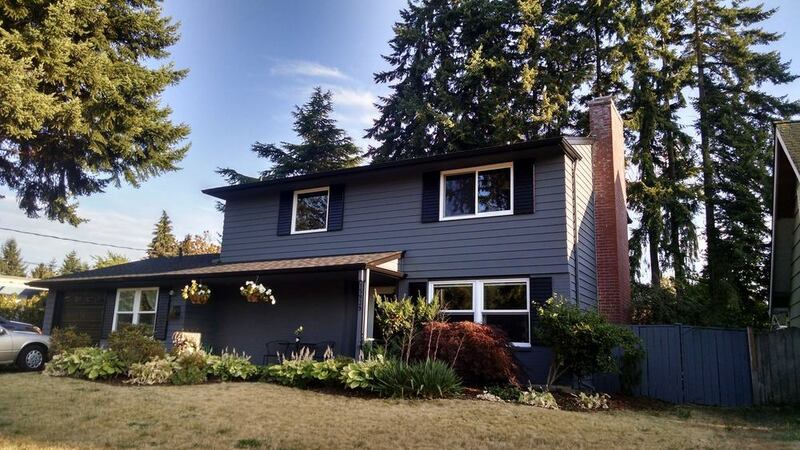 For this Bellevue home, we provided some much needed building envelopment improvements. Multifacet's expert technicians applied new Sherwin Williams paint to the exterior siding of the home, applied envelope basf sealant at joints, performed a PSE energy audit and lastly, installed a brand new IKO Cambridge asphalt shingle roofing system. All these home improvement services will better ensure the building envelope of this home continues to provide the best protection from the outside elements. The building envelope improvements we made on this home will greatly improve the home's energy efficiency. By sealing gaps, cracks, leaks and holes within the building envelope and creating air barrier continuity, polyurethane foam sealants have helped lower energy demand and consumption. In addition to energy efficiency, the quality of a building's envelope directly affects its durability and the health, safety and comfort of its occupants. Stop costly uncontrolled air leakage by sealing gaps, cracks and holes in the building envelope with foam sealants. As we did in this home with envelope basf sealant at the joints to improve energy efficiency and durability. This home's new IKO Cambridge asphalt shingle roofing system will offer years of worry free protection from the elements for the homeowner. Here at Multifacet we are happy to add another happy customer to our long list of Pacific Northwest property owners. Interested in choosing Multifacet as your trusted home improvement contractor? Click below for a free estimate on your next home improvement project today!